You are here: Home / Breeds / Mix / Australian Shepherd Golden Retriever Mix: Getting To Know Them! Australian Shepherd Golden Retriever Mix: Getting To Know Them! The Australian Shepherd Golden Retriever mix is part of a growing trend for crossbreed dogs. Australian Shepherds and Golden Retrievers are both extremely popular working dogs and family pets. Perhaps an Australian Shepherd Golden Retriever cross was inevitable. But what can you expect from an Australian Retriever when you get home? How big do they get? Which parent will they most look like? Are they healthy, and are they good family pets? The Australian Shepherd Golden Retriever crossbreed has two pedigree parents. Some breeders are opposed to crossbreeding because it removes the predictability and reliability of purebred litters. There are also fears that some crossbreeds are victims of their own popularity, and show up in puppy mills and pet stores. On the other hand, crossbreeding widens a puppy’s gene pool. This can increase newborn survival, extend their life span and reduce inherited diseases. But this may not always be supported by evidence, as shown by a study from 2013. You can read more about the designer dog debate here. Where Does the Australian Shepherd Golden Retriever Mix Come From? Golden Retrievers are originally from Scotland. They were first bred by Lord Tweedmouth at his estate in Inverness-Shire in the 1800s. They were originally used as gundogs, retrieving waterfowl on estates and beyond. Despite the name, the Australian Shepherd originated in Europe. It was first bred in the Pyrenees Mountains by Pyrenean Shepherds. Their stellar herding skills, unflagging work ethic and pleasant nature meant that wherever people migrated, they were sure to take these dogs too. First the Basque people took them to Australia, and then later they made the long voyage to America. It was there, in California, that the modern Aussie was developed. The Australian Shepherd Golden Retriever combines two of our best loved breeds. They have famous owners too—Oprah Winfrey has two Golden Retrievers and Steve Jobs owned an Australian Shepherd. You might also enjoy our guide to the adorable Mini Golden Retriever. Australian Shepherd Golden Retriever mix dogs are sometimes called Australian Retrievers, Australian Golden Retrievers and Aussie Golden Retrievers. According to the AKC, Golden Retrievers are between 22 and 23 centimeters tall (at the shoulder). The Australian Shepherd is between 18 and 21 centimeters tall, depending on whether the dog is male or female. Male Australian Shepherds weigh between 50 and 65 pounds, whereas females tip the scales between 40 and 55 pounds. Golden Retrievers are slightly heavier than Australian Shepherds. Males weigh between 65 and 75 pounds. Females weigh between 55 and 65 pounds. Therefore, you can expect your Australian Shepherd Golden Retriever mix to be a medium-size dog. Like all hybrid dogs, it’s impossible to predict in advance exactly what your Australian Shepherd Golden Retriever cross will look like. This dog could be a dead ringer for a Golden Retriever, the spitting image of an Aussie or a mix of both. The only thing you can guarantee are the qualities both breeds share. Both dogs are water repellent and have undercoats. And the hair of both breeds can be straight or wavy. Both breeds also have a ruff on neck. Therefore, the offspring of this cross will have a warm double coat, straight or wavy hair, and a mane around the neck. But the eye and coat color of this mix may vary. 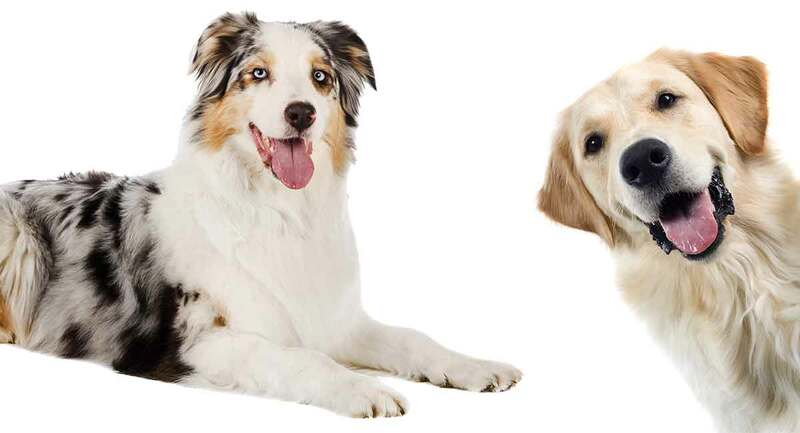 The Golden Retriever has brown eyes whereas the Australian Shepherd has a variety of eye colors. The Golden Retriever’s coat comes in a spectrum of glossy caramel tones. The Aussie can sport a coat of blue, red or black, with tan or copper markings, and patches on merle pattern or white. The eye and coat color of the offspring of this cross may lean more toward either parent or be a mixture of both. However, as the offspring is a mix of the breeds, and genes, it is hard to predict the physical characteristics of the puppies. Golden Retrievers are generally considered to have an excellent temperament, although a few aggressive individuals have been recorded. This may be partially genetic, although further research is needed. Australian Shepherds were originally bred to be herding dogs whereas the Golden Retriever was originally a gundog. This means both dogs—and the Australian Retriever mix—thrive on working alongside humans and showing off their mental and physical agility. The Australian Shepherd is highly intelligent but often shows herding tendencies such as nipping at people’s heels. The Golden Retriever may show gundog tendencies (e.g. enjoying chasing balls). However, this can depend on whether the individual came from a working line. In a 1985 study of 56 dog breeds, both the Golden Retriever and Australian Shepherd scored lower for excitability than many other breeds. The Golden Retriever also has significantly fewer watchdog barking behaviors than the Australian Shepherd, who has an average amount. In the study of 56 dog breeds, both the Australian Shepherd and the Golden Retriever were easier to potty train than most of the other breeds. You can capitalize on their natural good instincts with our detailed potty training guides. The Golden Retriever also demonstrated a greater ability to pick up obedience training than many other breeds. Australian shepherds show this tendency too. Both the Golden Retriever and the Australian Shepherd are intelligent breeds, which may be the reason they are easy to train. Our puppy training guides will help you harness that intelligence and get training off to a flying start. A useful guide on crate training a puppy can be found here. As with all breeds, early socializing is important for your Australian Shepherd Golden Retriever mix. This will help prevent behavioral issues towards people, environments and other dogs when your puppy gets older. According to The Kennel Club, a puppy needs 5 minutes exercise for each month of its life. They need an opportunity to exercise twice a day. As the puppy gets older, the amount of exercise can be increased. You can read more about puppies’ exercise requirements here. Energetic, healthy litters has always been a priority for Aussie and Golden breeders. This means both breeds are happily free from conformational defects. But there are diseases more frequent among Australian Shepherds and Golden Retrievers than in the dog population as a whole. Your Australian Shepherd puppy could also inherit these from their parents, so let’s take a closer look. Since both breeds are prone to eye conditions and hip dysplasia, both (potential) parents should be tested before breeding. Good breeders will show you certificates of these tests and answer questions. And finally, it’s estimated that a quarter of the Golden population are carriers of the gene mutation for progressive retinal atrophy (PRA). Luckily the mutation is very rare among pedigree Australian Shepherds. But let’s say a Golden Retriever Australian Shepherd mix litter has Goldens on both sides of their family tree. In that case, both parents should be tested for the PRA gene to make sure at least one of them is clear of it. Do Australian Shepherd Golden Retriever Mixes Make Good Family Dogs? Many people consider the Golden Retriever an ideal family dog, mostly due to a great temperament. Indeed, they are often used as therapy dogs for this reason. The Aussie is also prized for being amiable and affectionate, as a good worker. Therefore, this mix may not be suitable for families with younger children. However, the suitability of an individual pup to family life depends on a variety of factors. These include your lifestyle; how much time you have to teach and reinforce appropriate behavior; and whether your Aussie Retriever turns out more Aussie or Retriever. The shelter staff will know exactly which breed that an Australian Shepherd Golden Retriever mix resembles. When you rescue a dog, the rescue center may carry out a home check. This includes sending a staff member to your home to assess how well a particular dog may fit into your life. Or, prepare for them to travel to the rescue center with the people and other dogs that live in your house. This will allow the rescue center to see how your potential new dog interacts with you and your other dogs. As the popularity of mixes has increased, they are being seen more often in pet stores and puppy mills. It is important to find a good breeder, as many have low levels of animal welfare. Our guide on looking for a puppy is a good place to start if you want to avoid common pitfalls and find the best puppy for you. Like all breeds, bringing home an Australian Shepherd Golden Retriever mix puppy is an expensive, time consuming commitment. Check out our guides on puppy care and training your puppy for lots of support and troubleshooting tips along the way. These guides cover areas such as feeding your puppy and how to stop a puppy from biting. Getting kitted up for a new canine arrival is a fun part of mentally preparing yourself. You can find the best harnesses for the Golden Retriever here. Discover the best food for Australian Shepherds here. And similar information for the Golden Retriever is here. As with all purebreds and mixes, a cross between an Australian Shepherd and Golden Retriever isn’t right for everyone..
Here’s a summary of their best and worst qualities. Aussies were bred to work all day and may need a lot of mental stimulation. They could display herding tendencies. Golden Retrievers are prone to several hereditary illnesses, which they might pass onto their puppies. Both parents of this mix are known for their loving nature, so their puppies are likely to be affectionate too. If you have an active lifestyle, this alert mix will fit the bill. They are usually clever, and pick up training and new commands easily. Find more charming Aussie mixes here. The Land of Pure Gold website has a list of Golden Retriever rescues in the United States. The Kennel Club’s website has a list of Golden Retriever rescues in the United Kingdom. Adoptable Golden Retrievers in Australia can be found on the Golden Retriever Rescue Inc’s website. Rescue Golden Retrievers in Canada can be found here. The U.S. has dedicated Australian Shepherd rescues, a list of which can be found here. The U.K. Kennel Club has a list of Australian Shepherd rescues. Australia-based Australian Shepherds are rescued through the Sweet Shepherd Rescue Australia network. Canada’s Australian Shepherds also have specific rescues, including the Australian Shepherd Rescue of Ontario. And if you know of other rescues focused on Golden Retrievers or Australian Shepherds, please let us know in the comments. Is an Australian Shepherd Golden Retriever Mix Right for Me? The Aussie Retriever combines two enduring popular breeds. For all mixed breed puppies, it’s important to bear in mind that you won’t find out which parent they most look or behave like until they grow up. If you have an active lifestyle and enough time to give this mix the mental stimulation it needs, he could make a great pet for you. “Australian Shepherd,” American Kennel Club. “Australian Shepherd,” The People’s Dispensary for Sick Animals. Bellumori, T.P., et al., 2013, “Prevalence of Inherited Disorders Among Mixed-Breed and Purebred Dogs: 27,254 Cases (1995–2010),” Journal of the American Veterinary Medical Association. Everts, R.E., et al., 2000, “Identification of a Premature Stop Codon in the Melanocyte-Stimulating Hormone Receptor Gene (mc1r) in Labrador and Golden Retrievers with Yellow Coat Colour,” Animal Genetics. “Golden Retriever,” The People’s Dispensary for Sick Animals. Hart, B.L. and Miller, M.F., 1985, “Behavioral Profiles of Dog Breeds,” Journal of the American Veterinary Medical Association. Kornegay, J.N., et al., 1988, “Muscular Dystrophy in a Litter of Golden Retriever Dogs,” Muscle & Nerve. Liinamo, A., et al., 2007, “Genetic Variation in Aggression-Related Traits in Golden Retriever Dogs,” Applied Animal Behaviour Science. Mellersh, C.S., et al., 2009, “Mutation in HSF4 Is Associated with Hereditary Cataract in the Australian Shepherd,” Veterinary Ophthalmology.